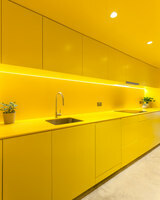 The kitchen plays an integral role at the heart of most contemporary homes. 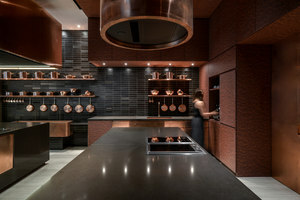 Much more than simply a place to cook, these multipurpose spaces have become the hub around which the main social areas are arranged. 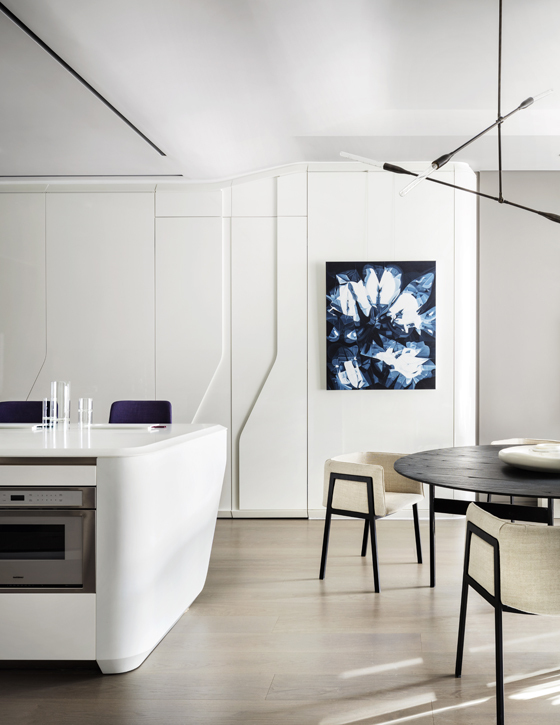 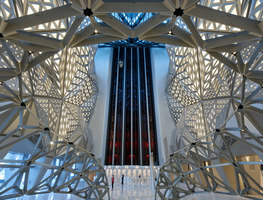 Architects are responding to their clients’ evolving lifestyles by designing open-plan kitchen and dining areas that provide settings suited to work or play, where families and friends can gather and spend quality time together. 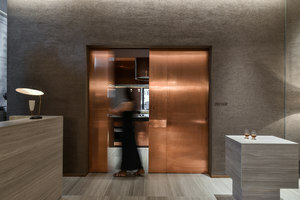 If the modern kitchen is to be part of the living space and therefore visible to guests, it must uphold the same standards as the rest of a building’s architecture. 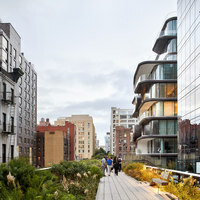 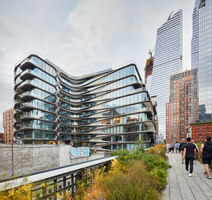 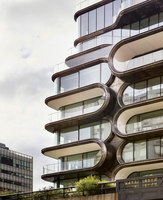 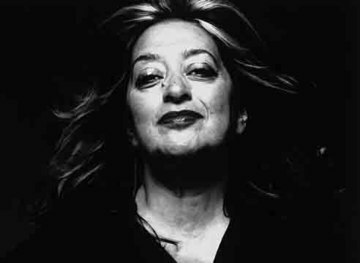 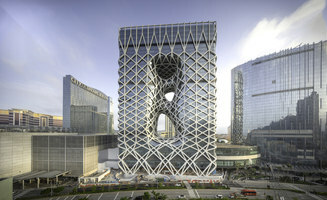 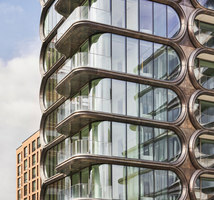 For the 520 West 28th apartment building in New York City, Zaha Hadid Architects designed the kitchen around a curvaceous island that echoes the sweeping lines of the sculptural facades. 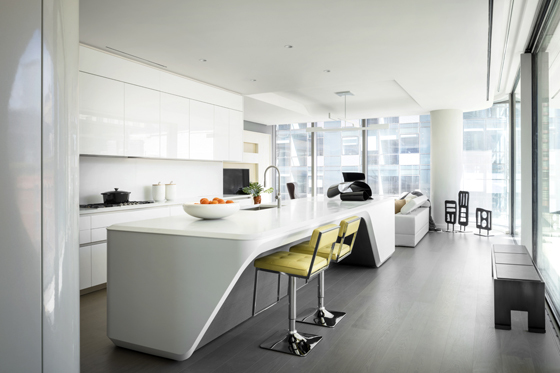 The island creates a bold statement at the centre of the living space, with its fluid form incorporating a cavity for storing stools. 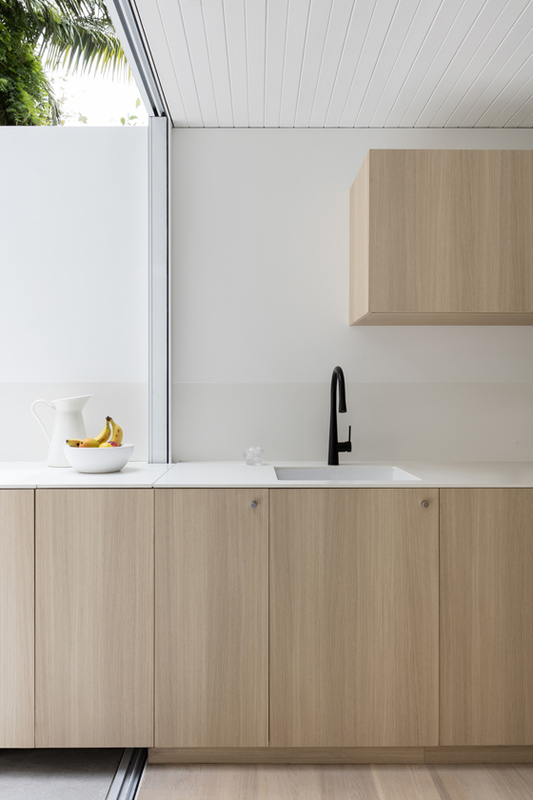 Italian design brand Boffi now manufactures the Cove kitchen, which can be tailored to the requirements of a specific space by altering the dimensions and surface finishes. 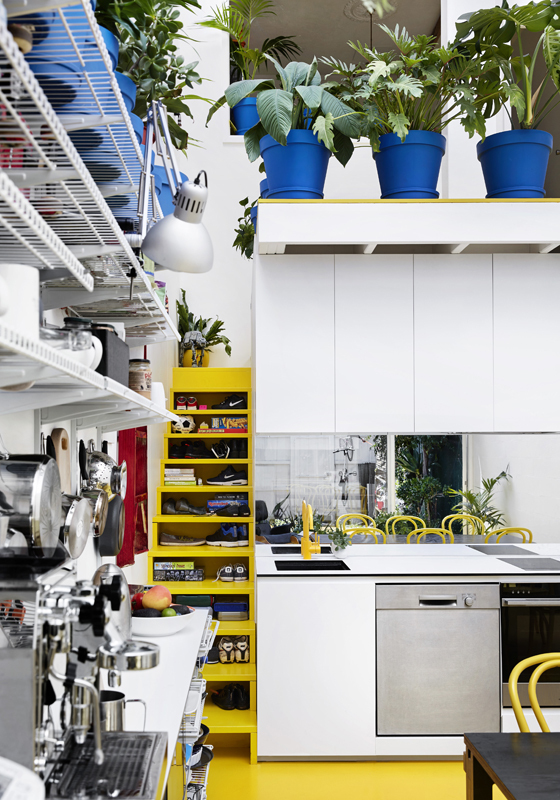 Anyone looking to install an architect-designed kitchen on a smaller budget can opt for Danish brand Reform’s range of high-end fronts and countertops for standard Ikea kitchen elements. 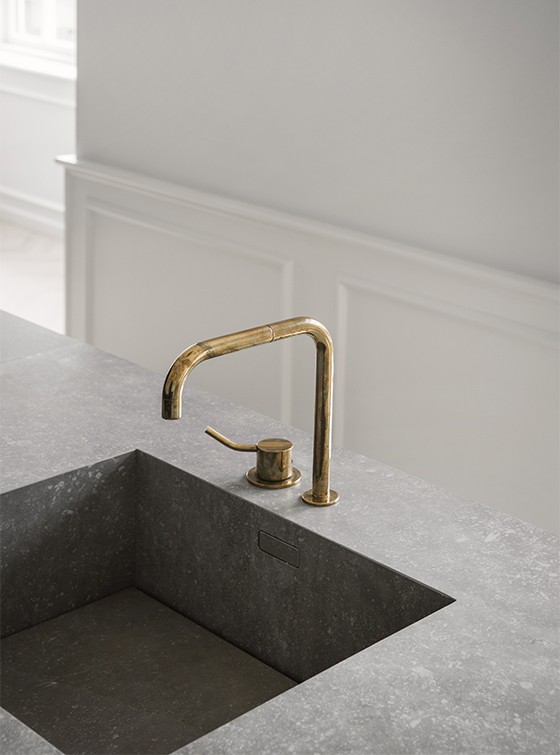 Architects and designers including Bjarke Ingels Group, Cecilie Manz and Note Design Studio have utilised premium materials and manufacturing methods to transform these basic units into stylish elements that can form part of a bespoke interior scheme. 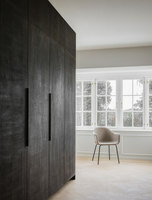 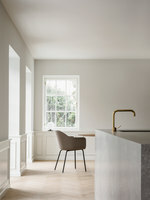 Norm Architects used the Surface kitchen it designed for Reform when refurbishing a historic villa in Copenhagen. 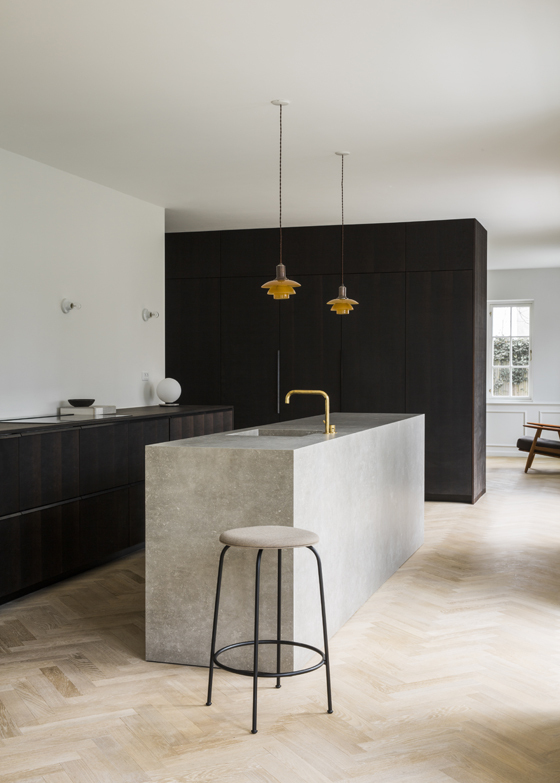 The cabinet doors in smoked oak with bronzed-copper handles and countertops in concrete and oak introduce tactility and a rich patina that is matched by the light-grey ceramic stone used to clad the central island. 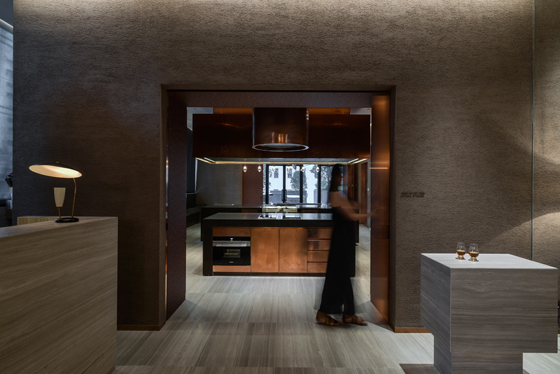 Texture, colour and patina all play an important role in a communal kitchen designed by multidisciplinary studio Simplicity for an apartment tower in Hong Kong. Influenced by the Western district’s traditional cuisine and contemporary cultural fusion, entrepreneur Adrian Cheng of New World Development envisaged the Clubhouse at the Bohemian House complex as a space where residents can gather to cook and socialise. 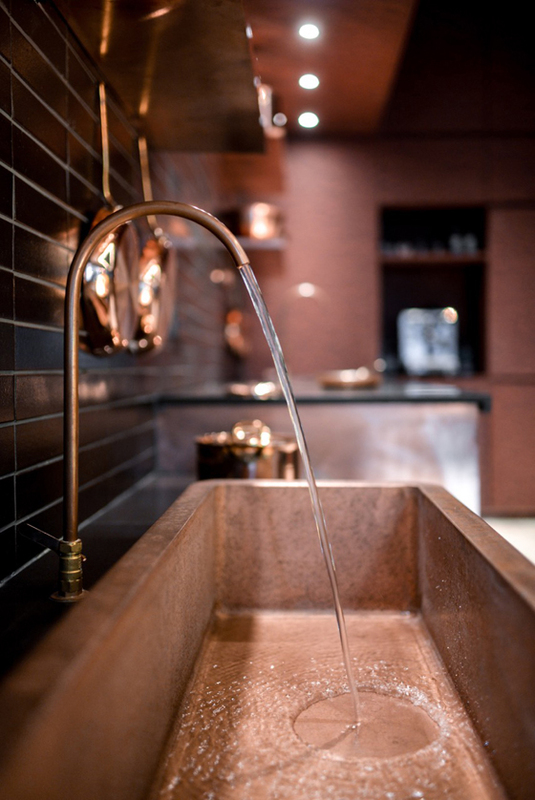 The simple interior design is influenced by Japanese traditions and applies natural materials to create a warm and familiar environment. 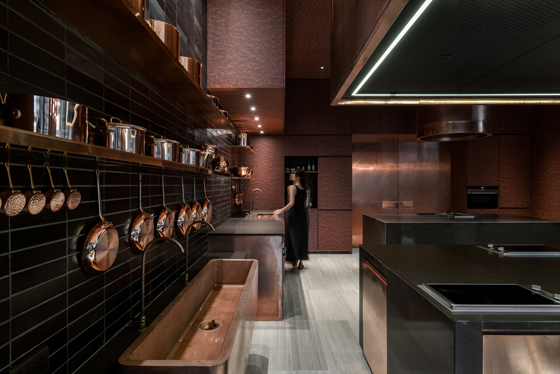 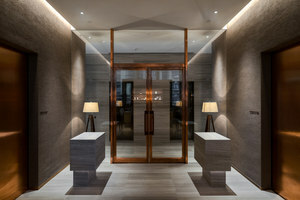 Patinated copper panels lining the walls are complemented by a rack of saucepans and a trough-like sink, while glossy black tiles and indirect lighting contribute to the muted ambience. 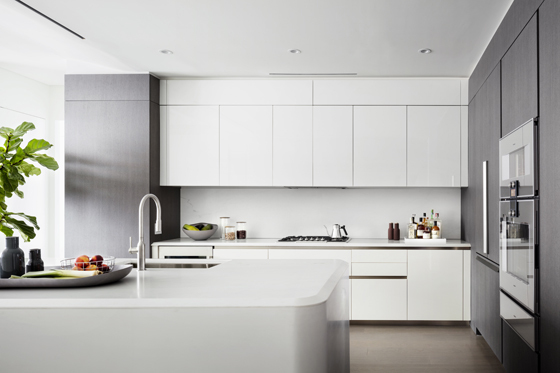 Where kitchens are designed to create a statement at the centre of a home, the standard white units and quartz countertops available from high-street suppliers simply don’t provide the required impact. 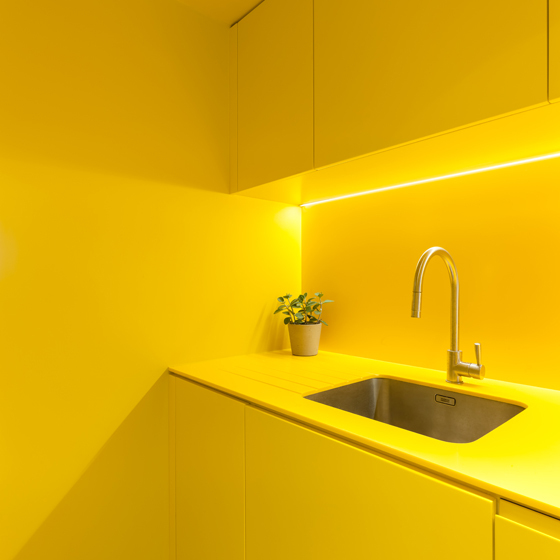 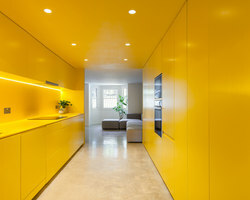 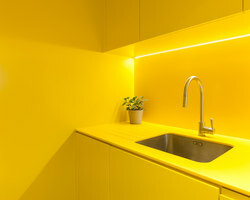 As part of the modernisation of a Victorian property in London, local studio Russian for Fish installed a vibrant yellow kitchen that acts as a focal point for the renovated lower-ground floor. 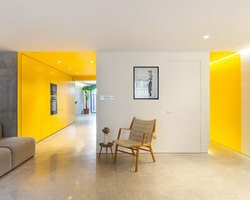 The architects transformed a previously dingy warren of corridors and underused rooms into an open space with views from one end to the other through the new galley kitchen. 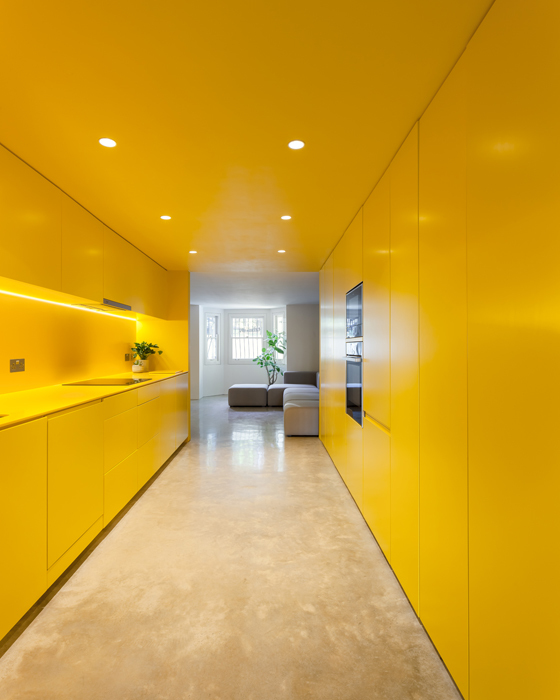 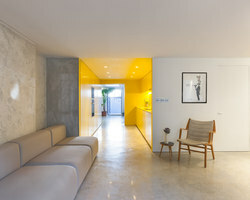 The kitchen’s walls, ceiling and built-in units are all finished in the same yellow hue, which was chosen to enhance the bright feel of the subterranean space. In parts of the world fortunate enough to enjoy a suitably temperate climate, the kitchen may be connected to outdoor patios or gardens to provide opportunities for outdoor dining. 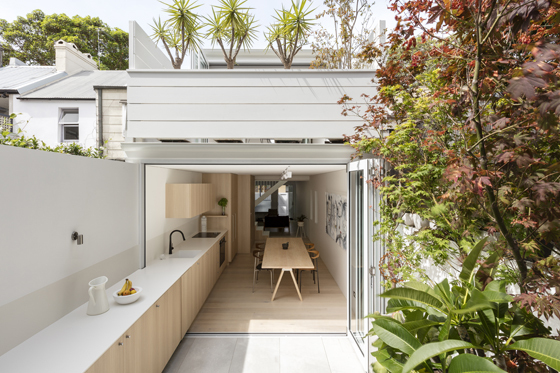 At a renovated terraced house in Sydney, local practice Benn & Penna Architects incorporated folding doors into the end wall of the kitchen and dining area to allow for a seamless transition between this space and an adjacent courtyard. 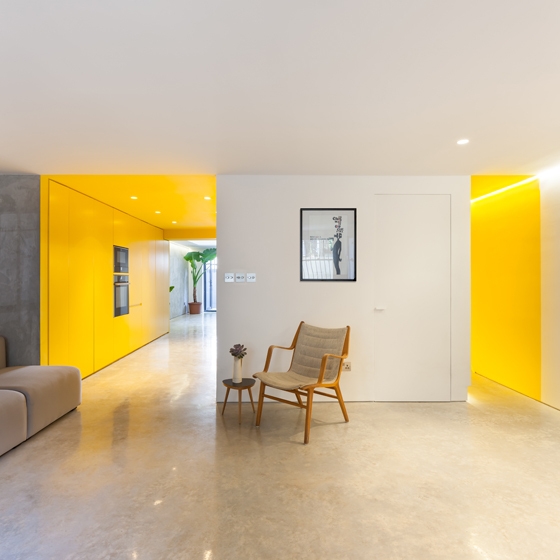 A countertop that extends through the facade and along the edge of the external space creates a sense of visual continuity and helps to make the reconfigured ground floor feel far more spacious. 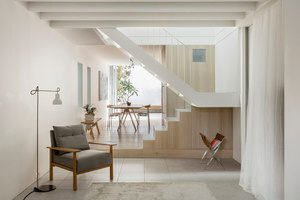 Also in Australia, architect Andrew Maynard combined several principles of contemporary kitchen architecture when refurbishing a Victorian building in Melbourne that contains his own home, as well as the offices of Austin Maynard Architects. 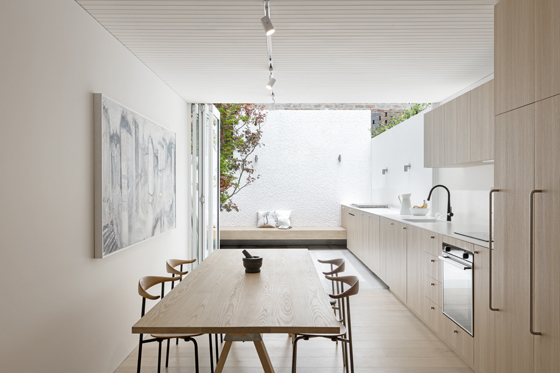 Maynard wanted the kitchen and dining area to be a bright and enjoyable place for his family and colleagues to use at all times of the day. 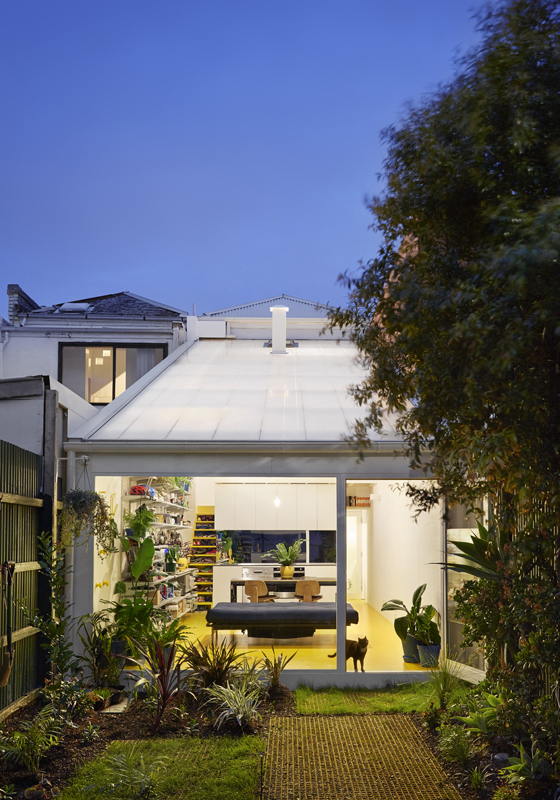 The double-height space is housed in a new extension covered with a polycarbonate roof that allows filtered daylight to flood the interior. 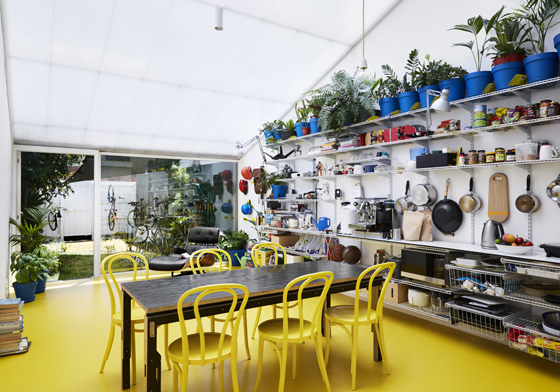 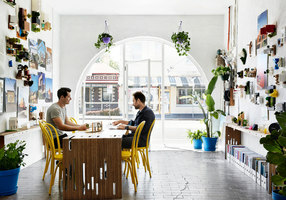 The playful room features open shelves and bright-yellow surfaces, as well as a mezzanine lounge overlooking the main space. 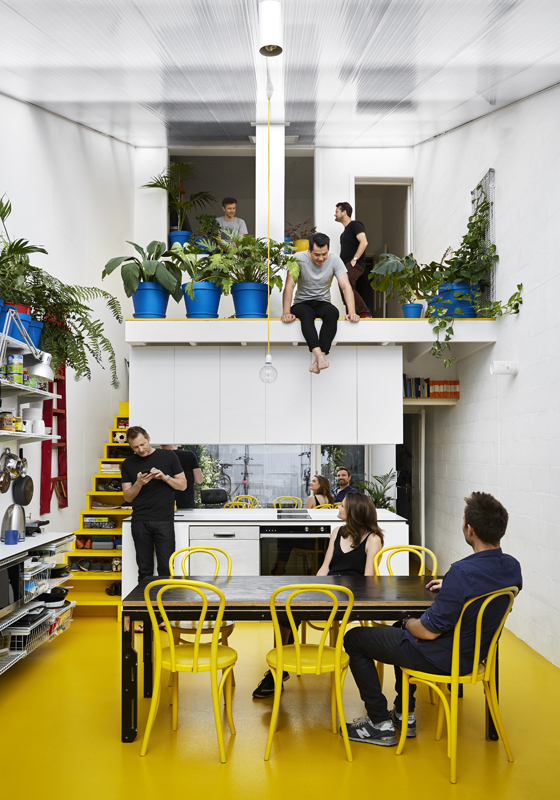 It’s an intelligent way to maximise the use of a room that would typically be vacant during the work day, transforming the kitchen into an all-hours zone for working, cooking, dining and entertaining.